Yummy, yummy, yummy, I love garlic. I love it in all ways, raw, sautéed but I especially love it roasted. I am getting hungry just thinking about it. 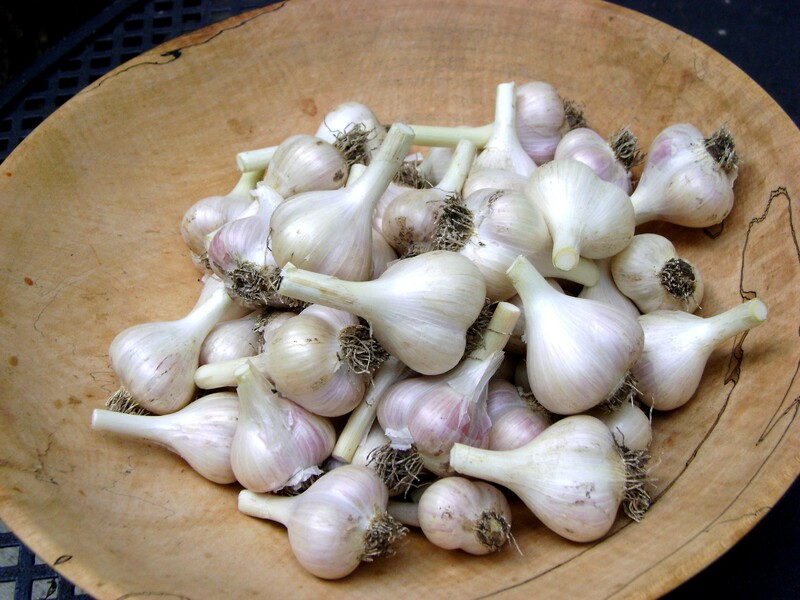 I do not grow a lot of different vegetables and herbs, my garden is quite shady, but I do grow garlic every year. It is so easy, that I feel slightly guilty even writing about it. In September, I just push a clove of garlic in, point side up, in rows about 6 inches apart with the cloves 6 inches apart as well. Thats it, that is all I do. In the spring they start growing, and growing. I do cut the scapes off when they start straightening up, they are quite curly at first. The first year I grew the garlic, I didn’t cut them off, I wanted to see what they looked like. They were nice, looked like a chive flower, but larger. What a mistake, they went to seed, and I had/have a million little garlic seedlings growing in my Kitchen Garden. Never again. In August, when the 3 or 4 sets of the lower leaves start browning, I dig them up, shake most of the soil off them and lay them out to dry. After they have been drying for a week, I rub a layer of the old dirty skin off, revealing the fresh white skin underneath, cut the top off and the roots. 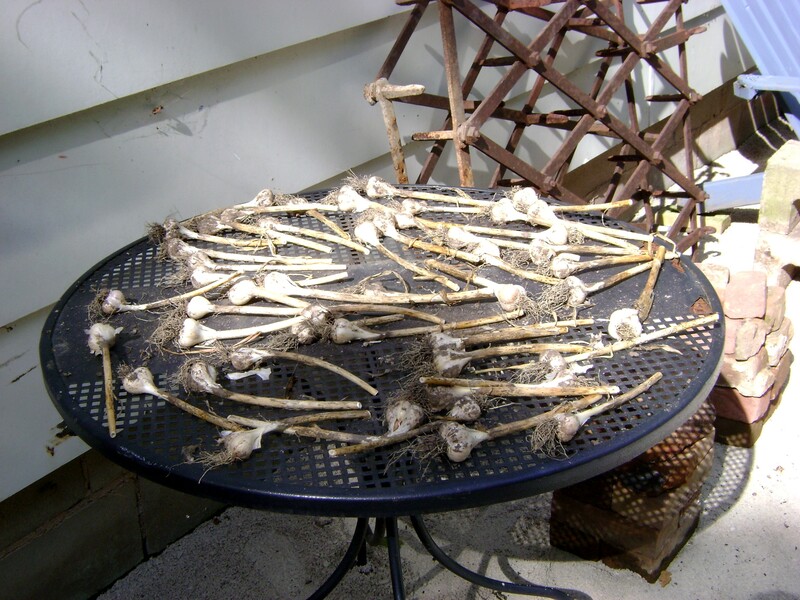 If you are curious to see what my garlic looked like last year, I think the bulbs were even larger, you can read about it here. I know most of you secretly laughed. 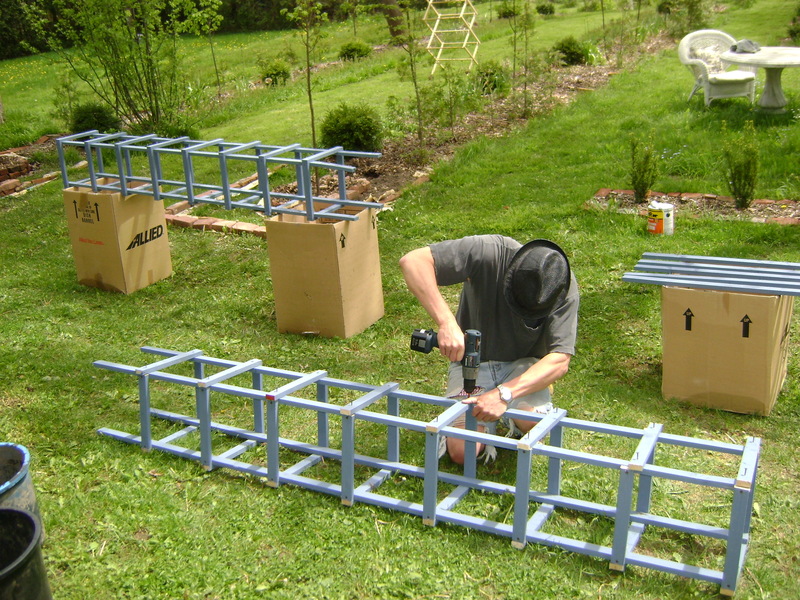 When you read about Ian building me the tomato towers, you were snickering, oh I heard you IG, don’t think for a minute I didn’t. Eight feet, eight feet, is she crazy. 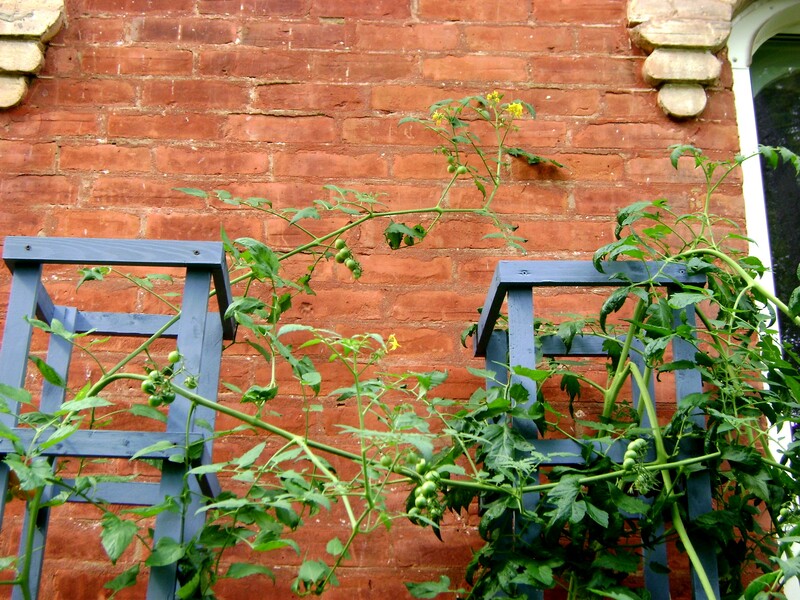 Who would expect a tomato plant to get eight feet in the air? They are way too tall. Well, you can stop laughing now. Look at them. I didn’t get up to Kilbourne Grove for a couple of weeks and they got away from me. I expect them to eat the house next. 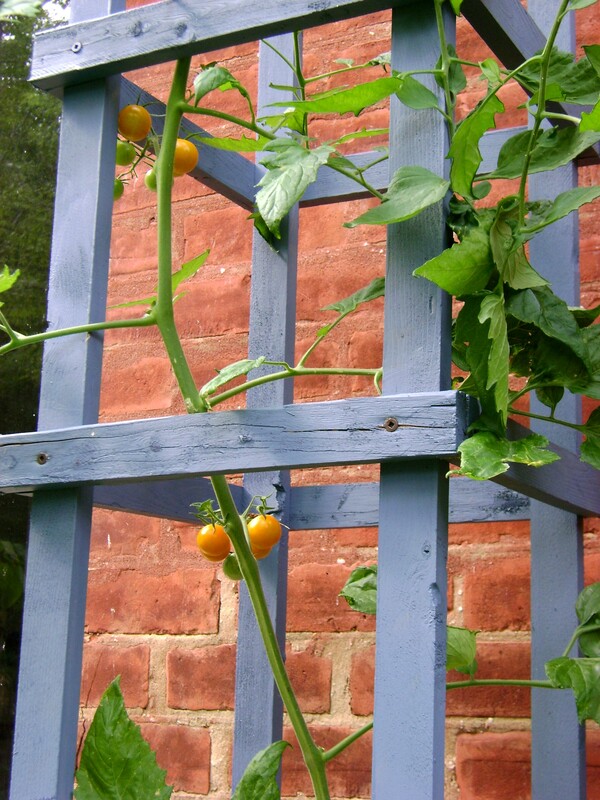 But at least they are ripening. It’s eat or be eaten, I know what I choose! 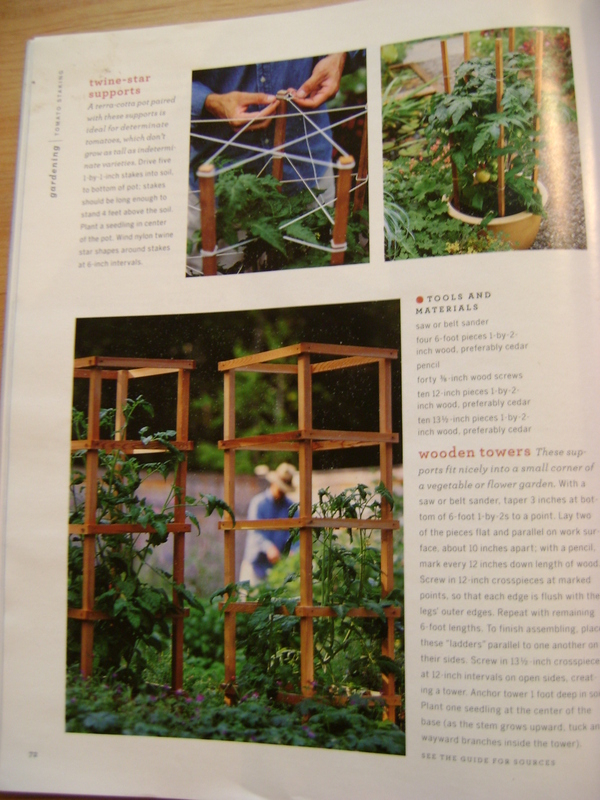 I was reading Martha Stewart magazine a couple of years ago, and found a very interesting article on plant staking. 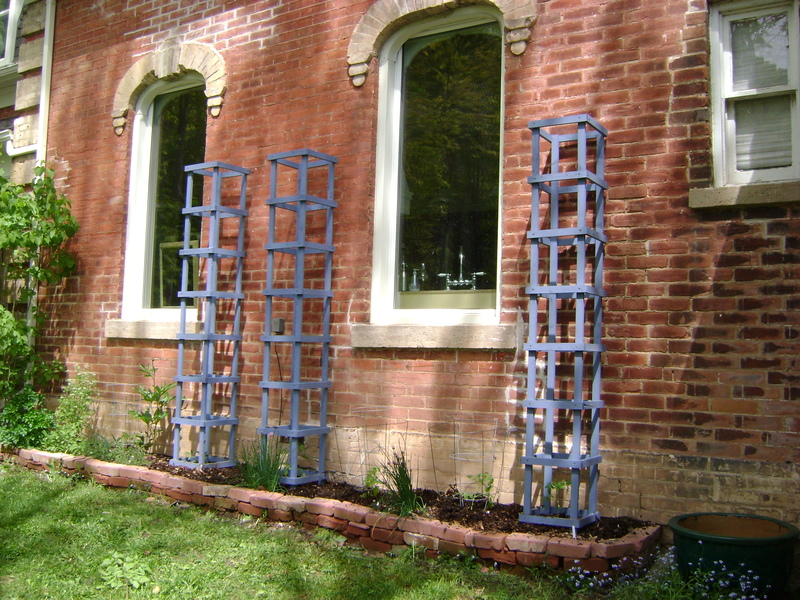 But it took a couple of years, before I could convince Ian to build me the tomato cages. 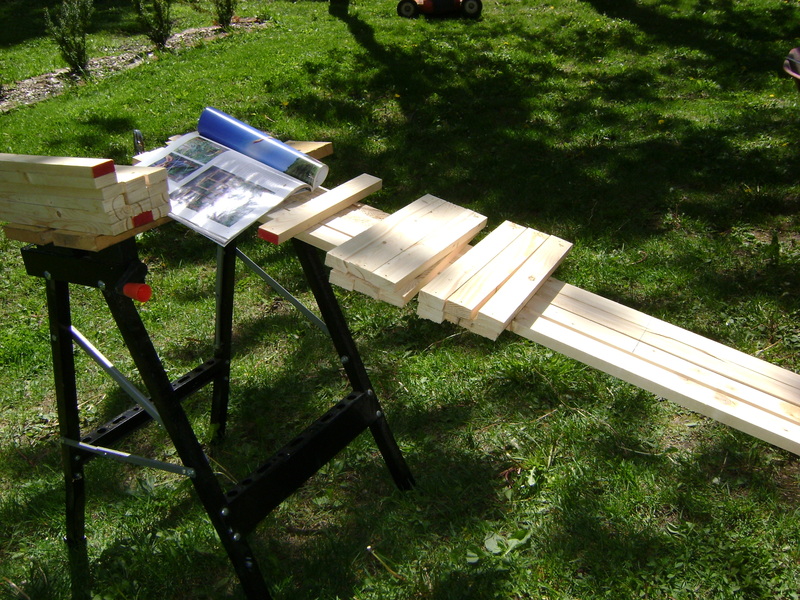 The plan called for 6 foot lengths of wood, but they go a foot into the ground. 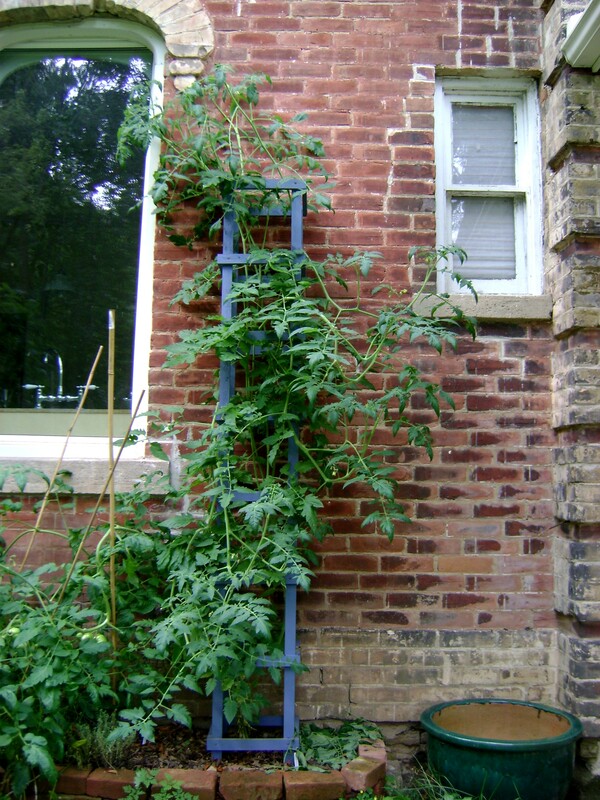 Did I not just tell you that my tomatoes get up to 6 feet, plus! I am a bit of a size queen, so mine had to be bigger, we bought 8 foot lengths. This way I figure, as the bottom (that is inserted into the soil rots) we can cut it down. By the time I am eighty, it should be about 4 feet high, just the right size! why go natural, when you can stain your wood “Kilbourne” blue! 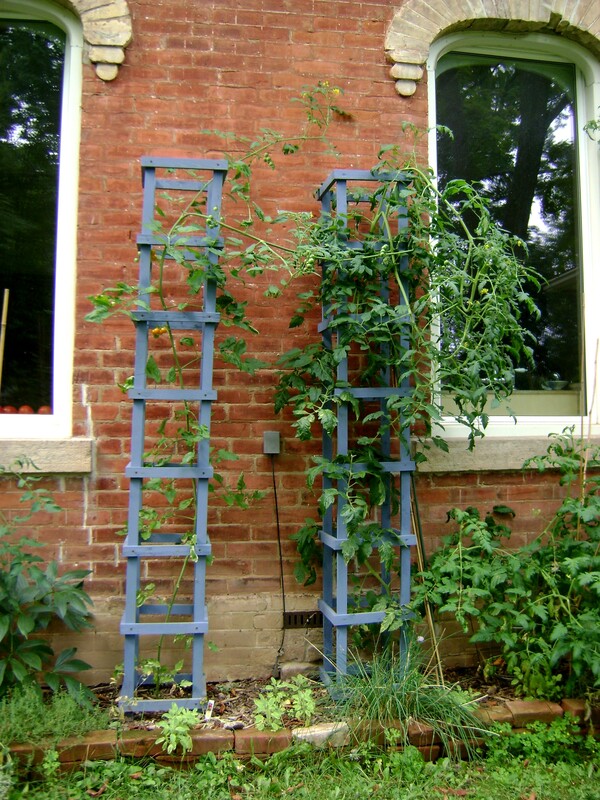 If I get tired of using them for tomatoes, (or I can sweet talk Ian into building me more), I could use them for clematis, morning glories, all kinds of climbers. As Martha would say “It’s a Good Thing”.